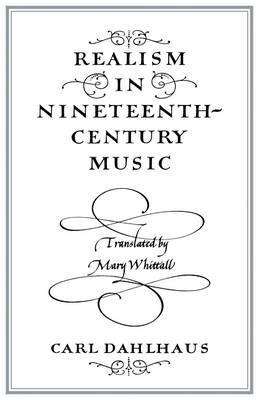 The music of the nineteenth century was - and still is - thought of as a 'romantic' art, whereas the main current of the literature and fine arts of the age was 'realist' from about 1830. Yet some works are consistently described as 'realistic': Nusorgsky's Boris and Bizet's Carmen are only the most frequently cited examples. Professor Dahlhaus sets out the criteria of realism, with particular reference to French and German theorists and examines the extent to which they apply to music too. While his findings do not reverse the verdict that the music of the age was in general romantic, he demonstrates that musical realism consists in much more than imitation of natural sounds or tone-painting. The notes are revised here for the English-speaking reader.